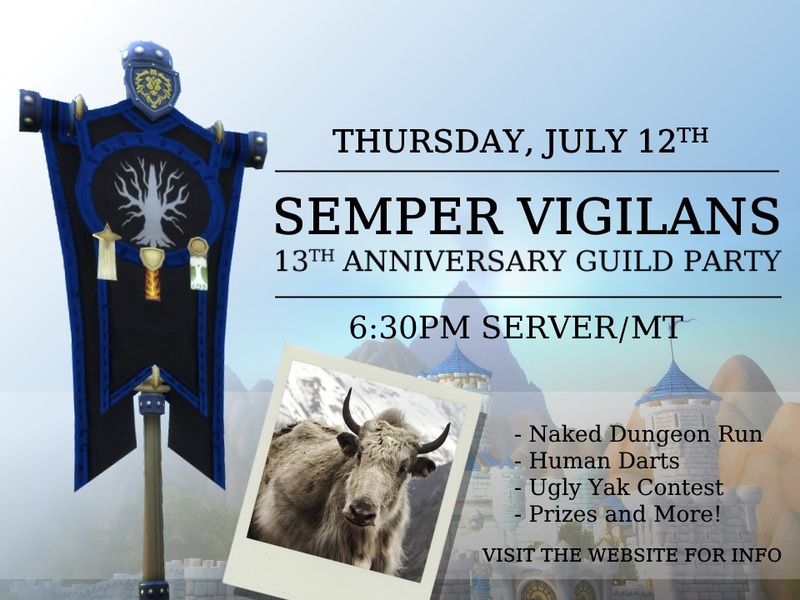 Help us celebrate our 13th anniversary by attending this year's guild party on Thurs, July 12th at 6:30p server time (MT). Naked Dungeon Run: Back by popular demand. Be sure to empty your bags you're going to need the space. Human Darts: It's not a guild party unless we all plummet to our deaths? Transmog Tournament: Can you out style your guild mates? + More if time allows! The party will kick off with our usual find Galena event. I will be hidden in our starting party location. If you like hide and go seek, this is the event for you. The first three to find me will win a prize. We'll go for 1.5-2 hours depending on how long everyone can stick around. So don't worry if you can't be there right from the start. Just log on when you can and join in the fun. If you want to donate to the prizes send any donations to Galena in game. If you want to lead an event, let me know and we will make sure to fit it in! I’ll do the 1x choice of store pet and 1x choice of store mount again, those are fun and require exactly the right amount of mat farming. Zinnie, if you have Fur from the last expansion, I can make more bags. The graphic was all Christy. I have no design abilities that I am aware of, but she is awesome and put it together for me really fast. Here's the official spreadsheet of all the party prizes. You have all out done yourselves. We have so many amazing gifts to give away. Thanks for your generosity, you make SV a wonderful place to call home in game!